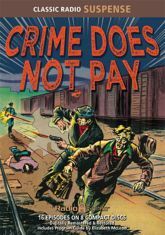 Tales of robbery, of violence, of murder -- ripped from the headlines! Adapted from the long-running series of MGM film shorts, here are tales of real-life crime and punishment brought to vivid radio life! Americans have always enjoyed true stories of bad men versus good -- the louder, the rowdier, and the bloodier the better -- and even more so if they can include a solid moral. This series has it all! Come hear how con artists and contract killers get what's coming to them. Performers include Parker Fennelly, Everett Sloane, Donald Buka, Myron McCormick, and more.